Cancer is impacting more lives today as compared to what it was 20 years ago. 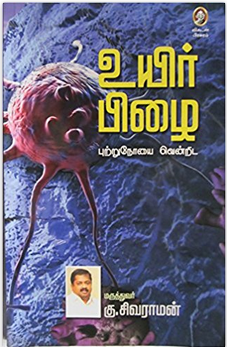 Through this book “Uyir Pizhai”, Dr. Sivaraman talks about various types of cancer, reasons for increasing cancer rates across the world and preventive steps to protect ourselves from this deadly disease. The reasons for the widespread increase of cancer are the following - genes, stress, pollution, obesity, modern lifestyle, processed foods, pesticides in food produce etc. Alcohol and cigarettes are the primary reasons for liver and lung cancer respectively, but even those who don’t smoke or drink alcohol are affected by cancer in other ways. Sodium lauryl sulphate in toothpaste, pesticides in fruits and vegetables, phthalates in shampoos, dioxin leeching from plastic when hot liquids are stored in them, taste enhancers, preservatives, artificial colours and various salts in processed, junk foods - the list goes on and on. Hormonal imbalances, increased consumption of processed nutrients through health drinks, high intake of junk foods are some of the key reasons for breast cancer. Dr.Sivaraman makes a valid point about soya. Consuming soya in the form of boiled soya beans or tofu occasionally is fine but most of the processed foods use “soy isoflavones” which increases estrogen in the body. Around 93% of soya produced in the world are GMO. So it is better to avoid soya as much as possible, as there are better natural protein substitutes available. As a preventive measure to keep away from breast cancer, recommended food products are green tea, organically grown tomatoes, broccoli, green peas and turmeric powder in everyday use. 1) Regular use of spices such as turmeric, coriander seeds, fenugreek (methi) seeds, cumin seeds, cinnamon, aniseed, asafoetida, garlic, shallots, dry ginger and curry leaves prevent cells from turning cancerous. 2) Pesticides sprayed on fruits and vegetables are listed under probable/possible carcinogens. Shift to organic fresh produce, grown locally. If buying them sounds expensive, start a small balcony vegetable garden in each of our homes. 3) Avoid plastic bottles for drinking water. Use copper or stainless steel ones. Use-and-throw paper cups have a layer of wax / polystyrene to withstand the heat. Always opt for ceramic or steel cups for hot beverages. 4) Avoid foods that have artificial colours and preservatives. Fresh food is the best. Foods rich in Vitamin B6, B12 and C help in preventing cancer. Instead of taking them as artificial supplements, select natural sources like fruits, vegetables and greens. 5) Though cocoa has good properties, commercial chocolates have less than 5% of cocoa in them. The rest 95% are artificial colours, milk protein, chemicals, fats and loads of sugar. 6) Basic necessities for well-being such as good sleep, relaxation, avoiding stress, being happy, regular exercise etc are equally relevant for preventing cancer too. This book is a treasure of information for everyone to understand about various forms of cancer and preventive remedies/solutions. Highly recommend it to all who can read Tamil.